Set your DVRs for this week's film noir. 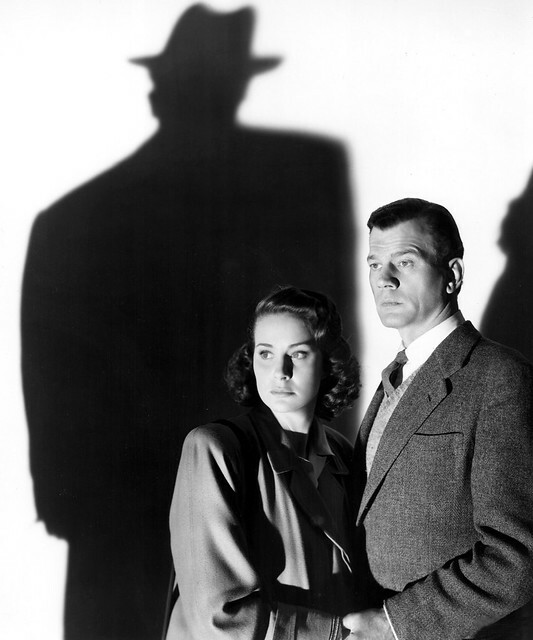 The Third Man (1949), starring Alida Valli and Joseph Cotten (above) will air at 1:15 a.m. June 27 (late Friday night/early Saturday morning) as part of TCM's noir festival, Summer of Darkness. Below, I'll outline the noir elements in this classic Cold War thriller. The Third Man (1949) is both a great film noir, and a timeless masterpiece that transcends the noir style to become one of the landmarks of world cinema. 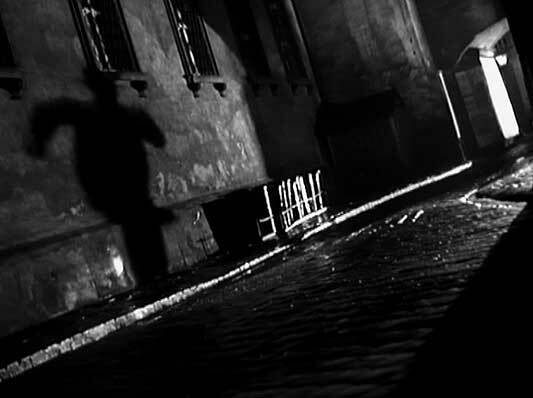 Director Carol Reed uses many noir tropes -- shadows, night scenes, tilted camera angles -- but The Third Man's narrative structure has more in common with the suspense films of Alfred Hitchcock. The Third Man tells the story of Holly Martins (Joseph Cotten), a writer of dime-store Westerns like Death at Double X Ranch, who arrives in postwar Vienna because his boyhood friend, Harry Lime (Orson Welles), has offered him a writing gig with his "medical charity." Things begin to go wrong almost immediately when Martins finds out that Lime was a notorious racketeer who was supposedly killed in a mysterious automobile accident. Shadows: Night cinematography and low-key lighting are hallmarks of the noir style, but Reed and cinematographer Robert Krasker use these elements in such a way that they create a stunning and distinctive work of art. The night scene where the police and Martins are awaiting Lime's arrival on Vienna's bombed-out streets, creates an unparalleled feeling of tension by using only light and shadow. Tilted camera angles: If you don't know what a Dutch tilt is before you watch The Third Man, then you'll certainly know what it by the time the movie is over. A Dutch tilt is a camera that is placed at an angle so the central image is askew as in the photo below of Harry Lime running through Vienna's streets. The Third Man is the Dutch-tiltingest movie of all time, with Reed using the distinctive camera angle several times to emphasize Holly's disorientation in an unfamiliar environment. An homage to silent films: About half of The Third Man's dialogue is in German. There aren't any subtitles, so Reed uses close-ups and gestures to set the mood and advance the plot. This technique hearkens back to silent cinema when directors had to rely on extreme close-ups of actors' faces and easily understandable gestures to express emotion. Reed uses quite a few extreme close-ups in The Third Man. A good example is the scene where Holly stumbles upon the murder of a porter who had given him information about Lime's accident. The large crowd of bystanders think Holly murdered the porter. Non-German speakers can't understand what is being said, but they can easily pick up on the menacing mood of the crowd by their scowls and especially by the throat-cutting gesture. The Plot: The Third Man has all of the visual elements of a film noir, but the plot doesn't feature many noir hallmarks. There aren't any flashbacks, and while there is a central mystery -- who was the third man at Harry's accident scene -- it's solved halfway through the film. Holly Martins isn't exactly a typical noir hero, either. He's certainly no cynical Sam Spade or Philip Marlowe. In fact, he seems to be the last of the Boy Scouts who believes the platitudes he writes in his Western novels. He can't even seem to grasp that when someone tells two or three different stories they're probably lying (if Holly was a quicker study, the movie would have been over in 20 minutes). Actually, The Third Man and Martins have a lot more in common with Alfred Hitchcock's suspense thrillers, especially films like The 39 Steps (1935) and North by Northwest (1959) where an innocent man is caught up in a web of intrigue that he doesn't fully understand. The best example of this is the scene where Holly is speaking in front of the book club while being menaced by Lime's associates (Ernst Deutsch and Siegfried Breuer). Harry Lime: The Third Man is one of the few films noir without a femme fatale. Instead, Harry Lime -- brilliantly played by Welles in what amounts to an extended cameo -- is the most seductive character in the film. Welles only has about 15 minutes of screen time and most of that is without dialogue, but, when he told director and critic Peter Bogdanovich that Harry Lime was the greatest star part in history, it wasn't just Welles' massive ego. Every major character in The Third Man is obsessed with Lime and he is quite literally the only topic of conversation: Holly calls him "the best friend I ever had," Harry's girlfriend (Valli) can't get over him and move on with her life, and a military police officer (Trevor Howard) spends all his time trying to capture the elusive racketeer (I understand that Harry is a horrible person, but I can't help but agree with Holly when he wonders why the Vienna police don't have anything better to do). Even the stray cats of Vienna can't resist Harry's charm, which leads to one of the best scenes in movie history. If you missed TCM's airing of The Third Man, you can catch it on DVD or video on demand. There is also a new 4K restoration of The Third Man that is playing in select cinemas across the U.S. The trailer for the restoration is below.